New Scientist published a research article in February about whether invertebrates feel pain, and I for one would like to congratulate them on publishing a non-sensationalist article about pain mechanisms. Why is it that an article about neural pathways, pain mechanisms and pain perception in invertebrates – such as crabs and squid – often uses better ‘pain language’ than the pain education resources provided by medical treatment companies? Special receptors called nociceptors – which sense excessive temperatures, noxious chemicals or mechanical injuries such as crushing or tearing – are found throughout the animal world, from humans to fruit flies... but when an animal responds to something we would consider painful, it does not necessarily mean the animal is in pain. The response might be a simple reflex, where signals do not travel all the way to the brain, bypassing the parts of the nervous system connected with the conscious perception of pain. When we scald our hand, for example, we immediately – and involuntarily – pull it away. Pain is the conscious experience that follows, once the signals have reached the brain. …when he brushed acetic acid on their antennae, they began grooming the treated antennae with complex, prolonged movements of both front legs. What’s more, the grooming diminished when local anaesthetic was applied beforehand. Elwood determines that insects are unlikely to feel pain, as “From an evolutionary perspective, the only reason for pain that makes sense to me is that it enables long-term protection” and as insects have extremely short life spans it is unlikely that they have the need to feel pain. 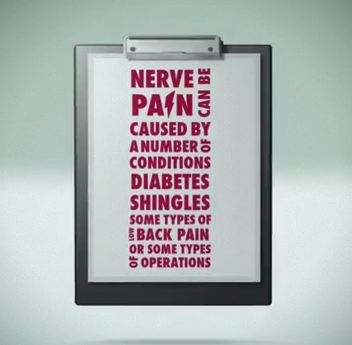 I originally came across this video for patients suffering ‘nerve pain’ marketed as a pain questionnaire on morethanmedication.com.au – Pfizer’s patient education site. More than 50% of chronic pain suffers describe symptoms of nerve pain. Nerve pain feels different to other types of pain. Nerve pain is caused by damage or injury to the nerves, the brain or the spinal cord. Nerve pain can be caused by a number of conditions. Diabetes, shingles, some types of LBP, or some types of operations. This type of language is fuelling the fears and anxieties surrounding pain genesis in the first place. A fine summary from Paula – NOI HQ’s graphic designer – after watching this video she said “I feel like I have these pains now”. I suspect that this is no coincidence. Perhaps this lack of sensationalism in New Scientist’s article exists because it’s easier to report objectively when the subject is not human, and the article content is less likely to evoke such a strong reaction from its readers because we cannot relate with a crustacean? And in contrast, as is likely the case for the Pfizer video, the pain language was manipulated to generate the emotional response that all marketing campaigns require. Thanks Kat – that “nerve pain” ad was driving me crazy. The contrast here really shows what we humans have done to ourselves. Big business knows how to manipulate the plebs? Surely not!! I’ve never seen anyone respond favourably to Lyrica. Most of the anti-epileptic spin offs have been dismal failures for chronic pain. How much of your interview did they edit out to get that one minute of thoughtful response . From what I know about Lyrica and other neural membrane stabilizers- don’t they work primarily at the peripheral nociceptive level? Advertisers like good propagandists often work by the rules of: make the complex inaccurately simplistic and the simple hopelessly complex therefore requiring the dependence on the knowledge of “those who know”. Kat, thank you – a very interesting piece for the lay person. It really made me think about marketing messages, both good and bad and the effects they have on people. 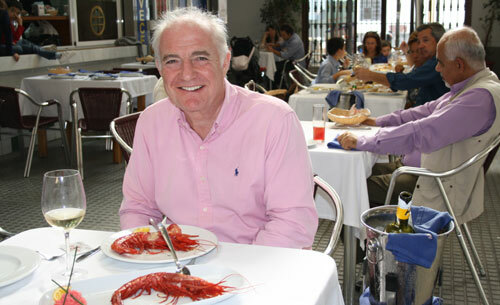 Not to mention the poor prawns. Well done! This is an excellent piece of work and I hope Pfizer read it!